After a month of epic excitement (flights, houseguests, a birthday), this is my first perfectly intact week since I began the atelier. Turning my energy back inward, I’m doing a quick mediation on what I wanted my weeks to look like and how I can rock this one. The bottle drawing. Yes, that’s right, more analytical drawing fun with bottles only now we’re drawing them as an arrangement. We’re using orthographic projection which means that even though the picture above shows bottles three rows deep, I’ll be manipulating the perspective to show them on one plane with all the bases aligned and figures overlapping. The point of this exercise is to force the issue of geometry and follow through lines. I’ve mentioned before that we work from big to small, so the first thing to consider is the orientation of the drawing (width by height), the overall gesture and geometry of the drawing and of course coincidences made by big follow-through lines. The picture above is the bottle arrangement currently set up in my light box. Your eye will immediately see three sets of diagonals connecting the tops of the bottles. What else can you see? if you draw straight horizontal lines from the top and bottom of the bottle mouthpieces you’ll see that several of them coincide. We are trying to wire our brains for pattern seeking. The more patterns you are aware of in a composition, the more unity you can create and the more powerful the drawing will be. The cast drawing. I’m doing a similar analytical exercise on a cast of a horse sculpture. Here’s my gesture drawing for it. It’s easier to obtain both accuracy and unity with a gesture drawing like this. Next, I’ll measure and chase the accuracy before finally drawing in shadow shapes and finishing the block-in stage. 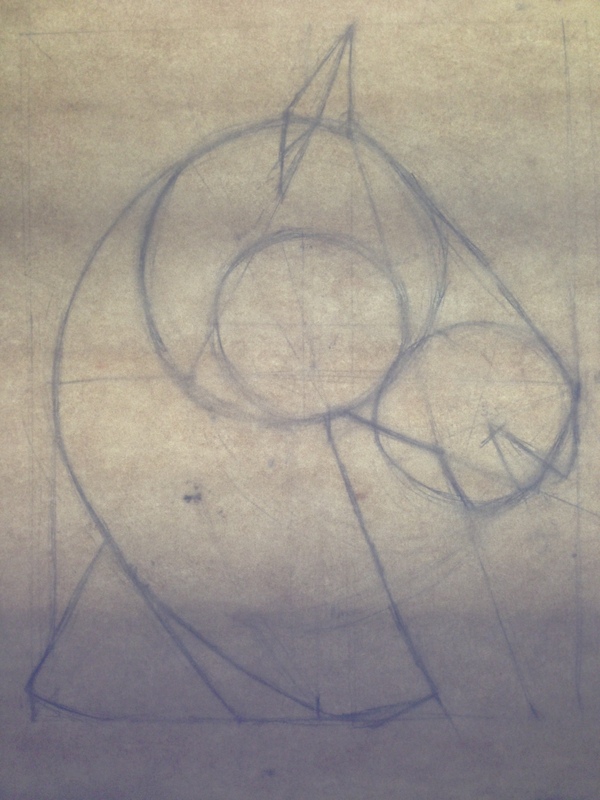 The next stage of drawing we’ll learn is called “turning form.” It is where you make two dimensional objects lift from the page by approximating the way light would cast across a round form. I’ve basically just described a complex version of shading. I hear it’s a very difficult and elusive skill to master. This week I want to finish the bottles by Wednesday and start working on the cast to have it done by Monday. Since Juliette gives critiques on Mondays I try to get whatever I’m working on in showable condition by then so I can get the most in-depth critiques. In life room we started a new weeklong pose today. From my vantage in the room there’s some distortion with a foreshortened leg — my achilles heel. Gotta remember to find the geometry and not listen to my brain when it insists I draw a leg shape instead of a diamond. 10:30 bedtime – without this, all is lost. Yoga MWF – today I went at the end of the day so it still counts! Reading mornings Tuesday & Thursday – Tomorrow I’m getting up at 5:45, making some tea and reading. Homemade lunches & dinners – I already have my lunch made for tomorrow and then we’re going to a pizza party for Emmett’s work, so that’s our one night out this week. And with that, it’s 10:30! Good night!